Hi and thanks for looking. Wildlife photographer, workshop taker, critter lover, veganist from South Wales, UK. 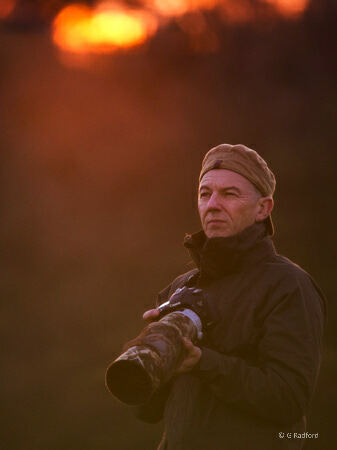 runs workshops, write a bit, a founding member of Natureship and a big fan of finding and photographing local wildlife. There's nothing better than lying silently in something I shouldn’t, while waiting patiently for the shot that doesn’t happen! Unless stated, all images are wild, no flash and never live baited. Wildlife photography is not an at 'all costs' pursuit, if you think it's wrong it probably is, it's just photography! All images are processed ONLY with Capture One Pro. use, purchase or simply get in touch. I very rarely use these but I have Hitech filters and a Giottos tripod with a Uniqball head. and a balaclava from Amazon! Images processed through Capture One Pro (v11) and am a C1 Beta tester. Enjoy, wonder, conserve but please leave everything as you find it.